You are here: Home / About ADHD / Happy Halloween! Halloween is my favorite holiday of the year. No gifts to buy, no big meals to make. Just candy and make believe. As you read this, I am sitting in my neighbors driveway handing out candy. Well, assuming you’re reading this while it’s dark out at my house. 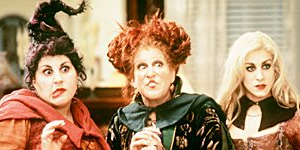 The witches from Hocus Pocus, one of my favorite movies. Each year we go over the top decorating the outside of our houses for Halloween all in a witch theme. Nothing too scary or gory. Then we dress up as witches, complete with cauldron full of candy and a fire pit for keeping warm. The whole neighborhood loves it and we have the best time. Kind of like #5 on the list of 5 Good Things About Having ADHD.